For those who want their ultra-exclusive coupe made a little more special. 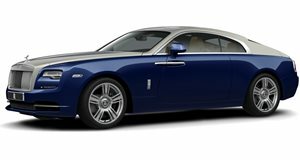 When it comes to shopping for a new coupe, at $320,000 it really doesn’t get much more exclusive than a Rolls-Royce Wraith. However, those looking to push the boundaries of exclusivity can head to Novitec’s recently formed Spofec division who followed up its Ghost program with something special for the ultra-luxury two-door. Carbon fiber was used to create new aerodynamic body panels, with a new front bumper, rocker panels, a new rear bumper and subtle rear spoiler. Other style upgrades include a set of 22-inch Spofec SP1 ten-double-spoke alloys, available in silver, matte black and titanium, and a lowering suspension that lowers the Wraith by up to 40 mm. A processor-controlled, plug-and-play N-tronic module helps boost output of the 6.6-liter twin-turbo V12 to 717 hp and 727 lb-ft of torque, enabling the coupe to sprint to 62 mph in 4.2 seconds. Stopping power is improved thanks to carbon-ceramic brakes, while a 5 kg lighter stainless-steel sports exhaust system enhances the car’s engine soundtrack via a remote controlled butterfly valve.